On Tuesday, opposition militias aligned with the US-backed Free Syrian Army (FSA) joined Al Qaeda-linked forces and criminal groups to issue a statement rejecting the political leadership of the Syrian National Coalition (SNC). They pledged to unite their efforts to topple the regime of Syrian President Bashar al-Assad and impose Islamist rule. Thirteen militias signed the document. The first signatory was the Al Nusra Front, one of the two main Al Qaeda-allied militias in Syria, which Washington has declared a terrorist organization. Several key militias previously loyal to the FSA’s Supreme Military Council also signed, including the Liwa al-Tawhid (Monotheism Brigade), Liwa al-Islam (Islam Brigade), and the Falcons of the Levant (Suqour al-Sham) Brigade. The militias that signed Tuesday’s declaration are active in much of Syria, but are particularly powerful in northern Syria. Al Qaeda forces have seized control of large areas along Syria’s border with Turkey. NATO and Persian Gulf weapons flow from Turkey to the Islamist opposition in Syria, where Al Qaeda forces have imposed a reign of terror enforced by Islamist death squads, largely financed by looting the population by means of emergency taxes. Liwa al-Tawhid leader Abdulaziz Salameh read out the statement in a video posted online. A spokesman for the organization told the Wall Street Journalthat the signatories would form a new political command structure and make a series of announcements in coming days. The Northern Storm Brigade—a group of smugglers and kidnappers based in the northwestern Syrian town of Aazaz, who met with US Senator John McCain during his surprise visit to Syria in May—also endorsed the statement. The joint statement of Al Qaeda-linked and FSA-linked militias comes amid rising anger within the entire Syrian opposition over the Obama administration’s decision to postpone a direct US war against Assad. SNC leader Ahmad Jarba met yesterday with US Secretary of State John Kerry, pressing for the US to call for regime-change in Syria and launch military action. 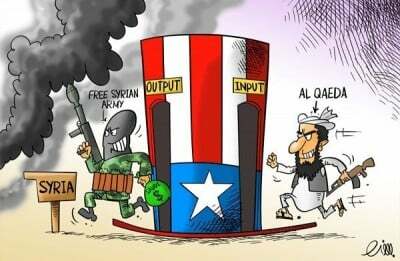 The alignment of FSA forces with Al Qaeda highlights the criminality and fraudulence of the US proxy war in Syria. The claims of Washington and its allies that in backing the FSA they were backing “moderate” or secular opposition forces against those linked to Al Qaeda were lies. These lies were designed to drag the American people into an unpopular war whose short-term goal was to install a pro-US dictatorship in Syria, with the broader aim of isolating Syria’s main ally in the region, Iran, and preparing for war against it. The various organizations set up by Washington to front for this policy—coalitions of Syrian Islamist and secular opposition politicians based in Turkey and France, such as the SNC, and loose coalitions of Syrian army deserters such as the central FSA leadership—were empty shells. They had virtually no popular support and no real influence over the far-right Islamist elements the United States and its NATO and Persian Gulf allies have been arming inside Syria. Such political fictions are being shattered by the Al Qaeda forces’ battlefield reverses and the Obama administration’s hesitation in going to war with Syria. Now that the SNC has failed to arrange for a US military intervention to rescue the opposition forces from defeat, these forces are signaling that they may dump the SNC, split up the FSA, and form an explicit alliance with Al Qaeda. The so-called “moderate” wing is, in fact, an unstable political coalition between various anti-working class forces. They included right-wing, middle-class “democracy” activists and Islamist operatives who aimed to recruit more backward layers of Syria’s Sunni rural population to an imperialist-backed sectarian war against religious minorities such as the Christians and Alawites. The Islamist militias in northern Syria are not only fighting the Assad regime, but increasingly fighting among each other for control of the loot seized from the population. Several militias that supported Tuesday’s declaration, including the Northern Storm Brigade, are reportedly fighting another Al Qaeda-linked militia, the Islamic State of Iraq in the Levant (ISIL). US officials are using this fighting within the opposition to present the Al Qaeda-linked forces they support as moderates who are opposed to far-right Islamism.